Lezzer Lumber Company has a dedicated outside sales staff focused on providing exceptional customer service to all contractors. Lezzer Commercial Sales provides knowledge and expertise to Developers, Commercial Contractors, and Professional Builders who focus on large projects from multi-family housing to hotels and more. Whether you’re in search of a new dream kitchen or bath, or are looking to add some minor updates to a living space, we have it all from quality products to great service. Brett Bloxdorf from Bloxdorf Contracting explains why his company uses Lezzer Lumber for all its custom home building material needs. Jamie Brubaker with Lawson Development explains why his company is relying on Lezzer Lumber to supply its framing, roof and floor trusses, Andersen Windows, metal doors, kitchen cabinets and interior trim at the Verde Apartment Complex in Hummelstown, PA.
Lezzer employees understand the importance of customer service, striving to meet the needs of their customers, going above and beyond the call of duty to ensure satisfaction. Our employees have a wealth of knowledge that our customers have come to rely on for order accuracy and job completion. Lezzer Lumber is committed to offering quality products at a fair and competitive price. 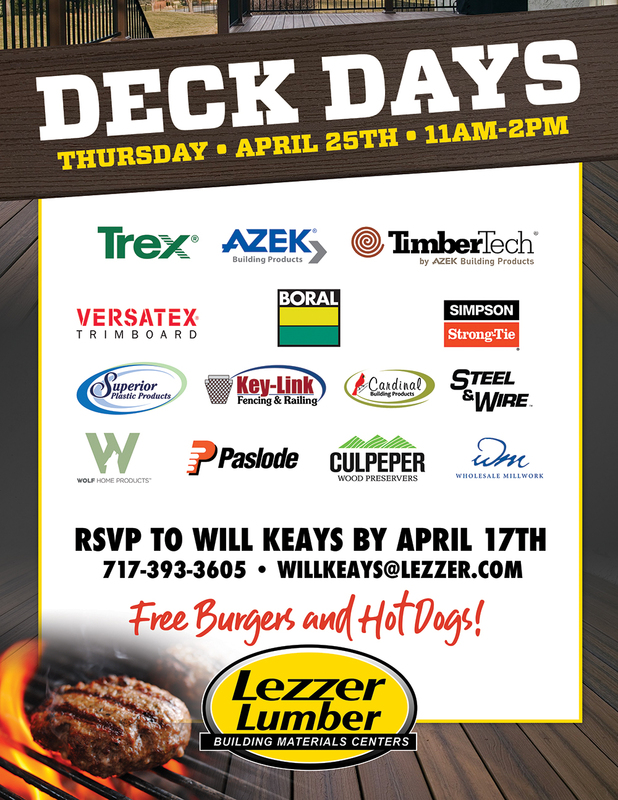 Lezzer Lumber works with great vendors to offer the best products to our customers. We know that not only our reputation, but the reputation of our customer relies on the assurance that our product lines are superior. Our dedication to customer service and the quality assurances behind our products is what makes us the premiere choice of homeowners, builders and contractors around Pennsylvania. From building services such as truss design and manufacturing, custom mill services, and commercial door capabilities to delivery services and truck fleet, we make it easy to negotiate your project timeline. Save time with full access to your account information – current and previous statements, invoices, orders and more, whenever you need it. We can setup your account to email your invoices daily and email your statement monthly. Integration with Accounting Systems Lezzer-OnLine info can be exported to Excel or Quickbooks. Click the Download button to download or open the Credit Application. Computer with PDF reading software required. Fill out the Credit Application Form either on your computer or on a printed hard copy and email to Jim Jordan. The success of Lezzer Lumber relies heavily on the success and dedication of our employees. Our employees are trained extensively to reach the goals of the company while simultaneously meeting the needs of the customer. We take pride in providing our employees with competitive wages and great benefits packages. GreenSky® offers a range of plans and products that can be used to finance home improvement projects purchased through Lezzer Lumber, including: kitchen and bath remodels, home additions, window, door and roof replacements, and much more. At Lezzer Lumber we offer two convenient financing options including no interest, no payments for 12 months, or a reduced APR of 9.99% for 84 months. If your project costs between $299 and $55,0000 then consider one of these plans. Get an instant credit decision. Click apply now under the program of your choice. Subject to credit approval. No payments and no interest during promotional period. Interest accrues during the promotional period but all Interest is waived if the purchase amount is paid in full before the end of the promtional period. Reduced APR of 9.99% for 84 Months! Subject to credit approval. Fixed APR of 9.99% for 84 months. Based on each $1,000 financed, 5 payments of $8.33 followed by 79 amortized payments of $17.32. Building Materials at Discount Prices. Overstocked, discontinued and special order returns. Prior to starting your financing project, consider one of our three available financing plans. Click the ‘Apply Now’ button on the plan you wish to apply for. Complete the online application on the next screen. Once submitted we will review your application and get back to you with further details. Lezzer Lumber is proud to announce the acquisition of People’s Building Supply in Stockertown, Pennsylvania. This addition will allow us to expand our service area into the Lehigh Valley and surrounding areas including Bucks and Montgomery Counties, Northern Philadelphia, Western New Jersey and North Pennsylvania into the Pocono’s. At Stockertown you can expect the same great employees that have been serving you for decades. We have big plans to expand the business by adding additional support and a dedicated outside sales team. View and apply for our open positions below, or learn more about the Stockertown expansion.